The women and men in these pictures are the Shakti Sings Choir. I'd never heard of them before I went to Glastonbury Festival. 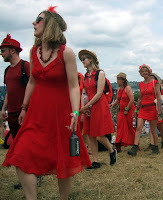 I was sitting at Worthy Farm's stone circle chilling out one afternoon when I saw this vision in red walking across the green fields of the sacred space singing a beautiful Earth-honouring song. When they reached the circle they invited people to join in and sing with them - which I did. 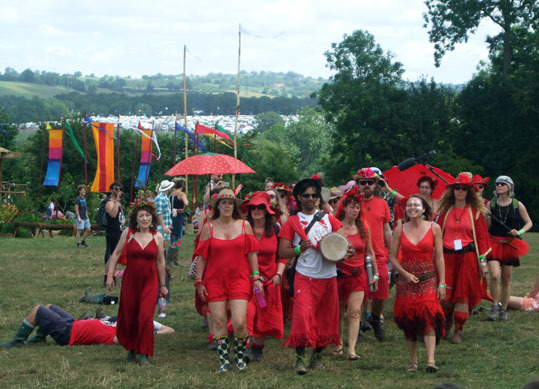 The Shakti Sings Choir was founded to honour the Earth through song. It does this out in nature, singing to the land at places such as the source of the Thames and Stonehenge as well as at Glastonbury every year.